Several adjacent water meadows on the banks of the River Avon: Species-rich wet grassland, with reed, sedges and old watercress beds. Up to twenty-five cattle in the summer. Wildlife: otter, ducks, meadow-sweet, curlew, lapwing, kingfisher, barn owl, Cetti's warbler, ragged robin. Another large water meadow in the Avon valley: species-rich wet grassland and sedge, with scrub and grazed river bank. Up to twenty cattle in the summer, and a few in winter when the weather is dry enough. Wildlife: otter, ducks, stonechat, reed bunting, Cetti's warbler, snipe, roe deer, brown hare, marsh valerian, bog-bean, marsh orchids. Avon Heath Country Park (Dorset County Council and RSPB), and adjacent land: A large heathland undergoing restoration. Dry and wet heath with pine woodland. Up to 25 cattle summer or winter. Wildlife: wood ant, blood-red ant, green woodpecker, crossbill, Dartford warbler, woodlark, tree pipit, nightjar, stonechat, buzzard, sand lizard. Somerley Heathland Restoration (Hampshire County Council): A filled and capped pit within Ringwood Forest, being restored to heathland. Usually between two and four cattle graze here during the summer, and up to ten in winter. Wildlife: nightjar, woodlark, tree pipit, siskin, silver-studded blue, grayling, reptiles, heath cockroach, Cornish heath, juniper. Another heathland near Ringwood Forest: This is neglected original heathland. Much pine has been cleared, and the heathland is now recovering. Up to ten cattle graze here summer or winter. Wildlife: sand lizard & other reptiles, woodlark, Dartford warbler, tree pipit, nightjar. 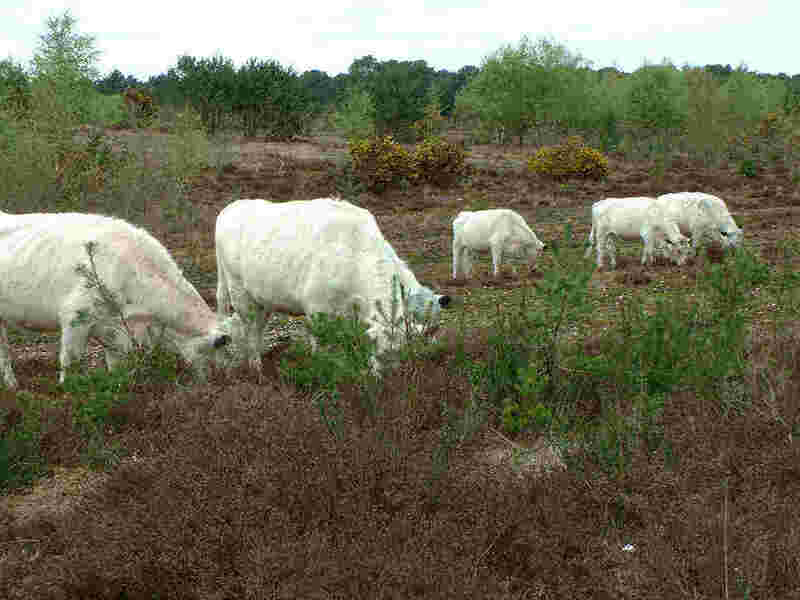 The New Forest: One of the most important heathlands in the world, it is maintained by ponies and cattle under ancient common rights. As commoners we contribute with up to a dozen cattle, winter or summer. The cattle particularly like standing on the local cricket pitch, looking just as if they are playing! Wildlife: very rich indeed. Curlew, lapwing, redstart, Dartford warbler, woodlark, dragonflies butterflies, orchids, etc, etc. We also have a small yard where a few cattle spend the winter.